It is ironic that considering the advanced technologies and computers we have today, auto companies are yet to achieve 100% fuel efficiency in automobiles. Almost two thirds of the energy contained in gasoline is wasted as heat. Scientists and engineers have been for long been working on using this heat to generate more energy. Scientists are working on a way to convert heat to electricity more efficiently. The traditional way of doing this is called thermoelectrics where semiconductor materials such as bismuth telluride produce electricity reacting to differences in temperature. Now a Californian company called BSST has created Thermoelectric generators using different semiconductor materials treated with hafnium and zirconium, which the company claims are much cheaper and about 40 percent more efficient than their counterparts. Many automobile companies have taken notice including BMW, Ford and Chevrolet already signed up to test this technology by this summer. 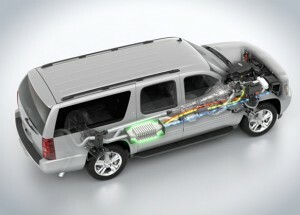 BSST has already said that it saw a 3 percent increase in fuel economy on a test model. A major factor in the performance of these thermoelectric generators is directly tied to the effectiveness of the thermoelectric materials used. 3 percent doesn’t sound like much so is this technology worth the hassle?